Listening to this album “Among Your Kind” by Kelsey Jarboe is like coming across a small room at the back of a gallery, filled with amazingly beautiful paintings by an artist as yet unknown, but perhaps not for much longer. Field recordings commingle here with spare instrumentation, evoking images of what one might call the “American Scene circa 2010.” Images, that is, of burnout, bankruptcy, and dread, but of hope and the possibility of redemption as well. Really great stuff, in other words — and already one of my favorite electronic/experimental albums of the year. 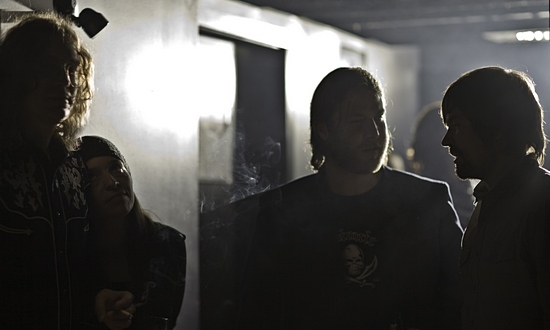 Check out the video, above, or listen to a few of the other tracks here. New Broken Social Scene lp, “Forgiveness Rock Record,” due out May 4. The beginning of the first track on this new lp, “The Besnard Lakes Are the Roaring Night,” sounds quite a bit like the beginning of “Fox on the Run.” And as awesome as that may be, things just get better from there. What I mean is that from there, a series of 5-to-7 minute epics unfold, guitars roaring through the night, just like the album’s title suggests, offset by the wonderful vocal performances provided by Jace Lasek and Olga Goreas. All that and more appears in “Albatross,” one of the album’s best tracks, which is available as a free download from the Jagjaguwar website. This is stuff that would sound great accompanied by a planetarium laser show, great through a car radio, great through headphones. In other words, just plain great. 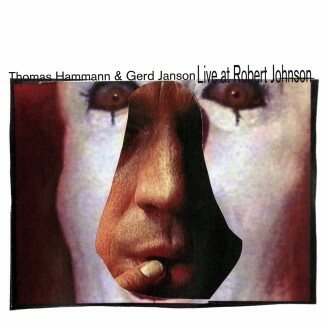 This excellent dj mix by Thomas Hammann and Gerd Janson is the fourth in the Live at Robert Johnson series, volumes 1 through 3 having been compiled by Chloe, Prins Thomas, and Ivan Smagghe. It’s also the best, at least if you ask me. The duo get things started with four great tracks: Juicy Fruit’s “Liferaft,” DJ Du Jour’s “A Fish Scene,” Lontano’s “Lovebass,” and FreshTunes’ “W.B.W.U.” And rather than jumping quickly from cut to cut, they let the songs play out for 7 minutes at a time, building up and establishing the deep groove that runs through the entire 70-minute recording. What’s great, as well, is that those are tracks released over a period of almost 15 years, running from 1995 to 2008. Mixing up the old with the new, it’s like Hammann and Janson are saying “what we’re playing are our all-time favorites, and we really don’t care what anyone else says about what’s in or out of fashion.” And, hence, their love of the house genre really shines through. Technical sophistication with the turntables is always impressive, but putting together a mix that’s truly soulful and moving is what makes this one even better. There are some people who put together pretty good PhD dissertations, but then never write anything else worth reading again. 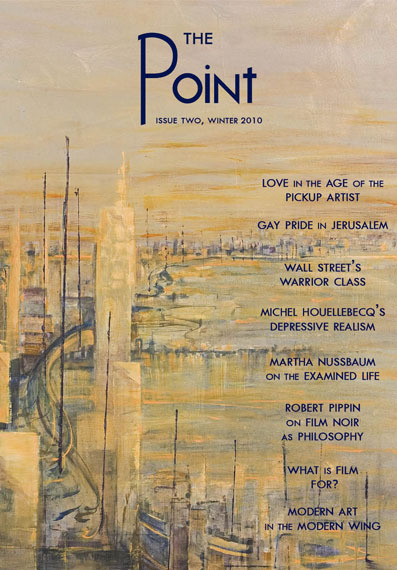 The editors of and contributors to this magazine, The Point, do not belong to that group. I really liked the first issue, which came out last spring, especially the article about David Foster Wallace. But this new, second issue goes a big step beyond. Including a fantastic essay on Stendhal by someone named S.G. Belknap, and a funny and insightful piece on Houellebecq by Ben Jeffery. Very nice reflection on philosophy by Martha Nussbaum. Maggie Taft’s review of the Art Institute of Chicago’s Modern Wing deserves to be read with “Daydream Nation” playing in the background, because it mentions Gerhard Richter. And there’s a tribute to/eulogy for John Hughes, nicely put by Sarah Miller-Davenport. Plus an absolutely brilliant piece by Etay Zwick that brings Veblen to bear on the current crisis, and pretty much hits the nail on the head as far as that topic is concerned. If these guys keep coming out with writing that’s anything close to this level, their magazine, I’d say, will deserve to be called the best and most important of its kind.